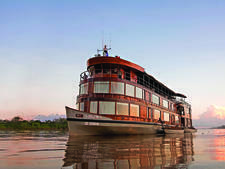 Delfin I cruises the Peruvian Amazon with 12 passengers. 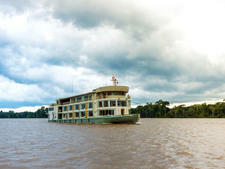 Delfin Amazon Cruises' 67-foot-long boat was built for taking wildlife expeditions. Completely refurbished in 2010, the interior of the ship has highly polished walls, floors and furniture made of native woods and comfortable cushioned seats. The walls are adorned with works by Peruvian artists. Floor-to-ceiling windows on all three decks, including in the suites, provide views of the river and rain forest. Three meals a day are served in the dining room. Breakfast is a buffet, with many choices, and lunch and dinner are served by the staff. The cuisine is Peruvian, with all dishes cooked with fresh fish, meats and vegetables. House wines are served with lunch and dinner. There is no assigned seating, and tables are spread out so passengers can eat alone, in couples or in large groups. Dietary restrictions are accommodated with advanced notice. Two Master Suites and two Deluxe Suites, each with a private terrace, have quiet air-conditioning. The Deluxe Suites also have private whirlpools. Passengers must choose king or twin beds in advance. Linens and towels of high-quality pima cotton are made by Peruvian companies. The bathroom includes separate toilet, sink and shower areas. Rooms are cleaned and freshened several times a day. Aside from the spacious private rooms, Delfin I offers plenty of space to relax on the third-level observation deck or in the bar area where nonalcoholic drinks (included in fare) are always available. Two heavy aluminum skiffs with 10 cushioned seats go out several times a day with highly knowledgeable, bilingual -- English and Spanish -- naturalists who have grown up in Peru. These expeditions take passengers into the Pacaya Samiria National Reserve, one of the largest protected areas in the country, with many species of birds, mammals, amphibians, reptiles and plants. At various times, passengers can choose from optional kayaking, swimming and piranha fishing. Activities are scheduled throughout the day, with ample breaks.